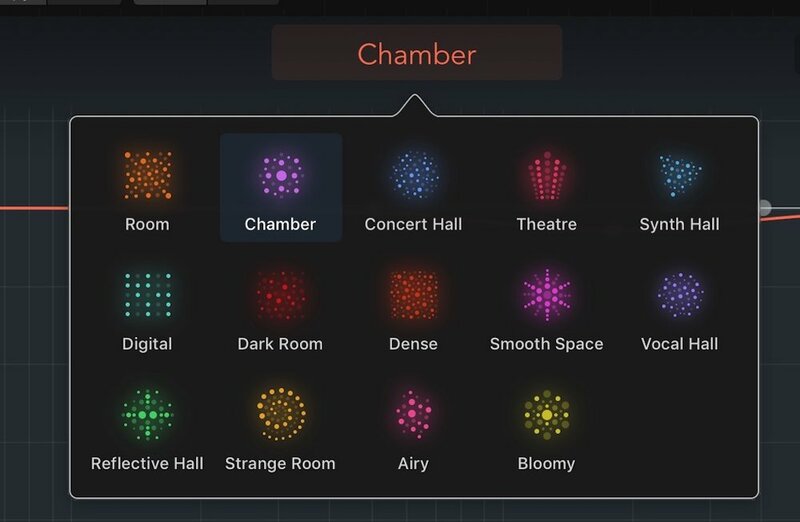 Logic Pro was long overdue for an updated algorithmic reverb, and ChromaVerb, introduced in Logic Pro X 10.4, is everything and more I had hoped for. In addition to sounding fantastic, it’s got several unique features that, I think, make it really stand out. Predelay, as we all know, places a delay between the original sound and the onset of the reverb’s early reflections and reverb tail. A longer predelay will move the reverb tail out of the way of the dry signal for more clarity. We usually adjust it by ear. Too much, and the reverb sounds too distant and artificial. Too close, and the original signal might not stand out sufficiently form the reverb tail. Being able to tempo sync it to a rhythmic value based on musical subdivisions adds a rhythmic element that can be very interesting. Freeze is an interesting function. When enabled, it allows you to recirculate the current signal indefinitely. It holds, or “freezes” the reverb in place at the time the function is invoked until it is suspended. Coupled with some judicious use of automation, it can create some interesting sustained reverb effects. Although it looks like an EQ, it’s not really. The horizontal axis is used to create a position in the frequency spectrum, like a regular EQ. But the vertical axis is used to scale the decay value at that specific position by percentage. On the right-hand vertical axis, we see the decay value indicated in seconds. As we change the central decay knob, the scale on the right changes. Put simply; the Damping EQ allows us to tailor the decay time at specific points in the frequency spectrum. The Mono Maker slider allows us to select a frequency point below which the signal is summed to mono. The range above the slider position remains in stereo. This is the greatest function I never knew I needed! Seriously though, it is great not only for interesting sound design but also for confining the low end of a subtly used reverb to mono. This is great, for example, if you are using a subtle drum room reverb and want to keep the low end tight and focused. And now here is that same reverb, with Mono Maker set to keep everything below 650 Hz in mono. A nice design touch is the ability to step through different room types in the popover window that appears when you click on the currently loaded room type name. These change the specific room algorithm used while preserving any settings you have tweaked on the bottom of the plug-in interface. It’s the same idea used in Logic’s Compressor. Set your basic parameters, and then audition different compressor algorithms by changing the type while everything else is preserved. With Chromaverb room types become progressively more lively and colorful, with the latter options exhibiting interesting and unusual reflection and bloom patterns. ChromaVerb is fun and intuitive to use, either for conventional reverbs, or more esoteric effects. Take some time to explore it!